An unofficial Croydon, Sutton and Surrey Green Party blog by Shasha Khan. Having lived in Croydon most of my life, I now live just outside the south west of the borough in Woodmansterne. WIll this all end in Civil War? It can't do. 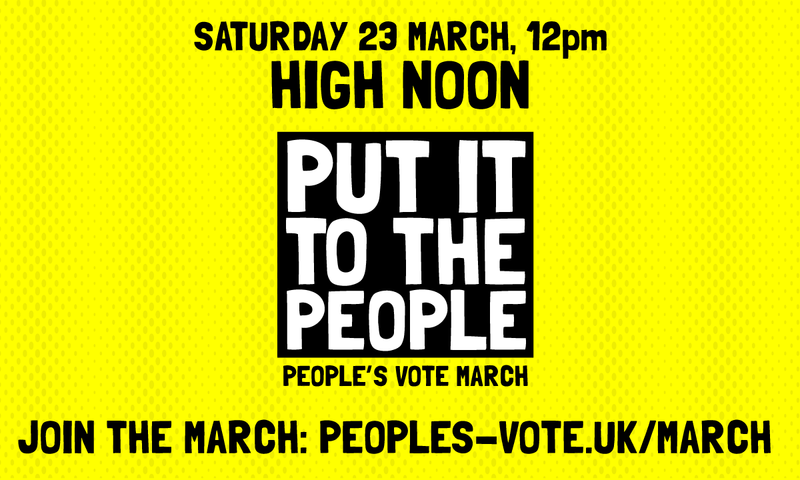 Today my family and I are going to the the Peoples Vote March in Central London. I am not paid up member of the 2nd referendum brigade because I am more concerned about how we heal the divisions that have become so starkly noticeable as a result of Brexit. 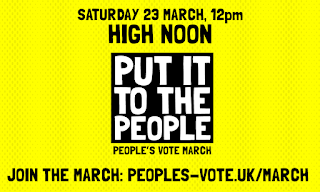 We went to the previous rally and I felt the mood was more disillusionment with Brexit, because if there was a referendum and a Remain type option won - it will only anger those that voted LEAVE in June 2016. I met, by chance, a consultant who works for financial institutions. Presently these institutions are looking for guidance on what is likely to happen with regard to Brexit. This senior individual noted many similarities with Trump in USA and Brexit in UK. 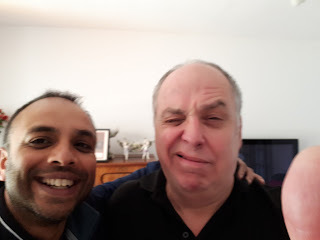 I jested with the consultant that in years to come, maybe we will look back at this time whilst in the midst of a civil war, wondering why we didn't do more to bridge the two sides of the Brexit debate. To my surprise the consultant didn't dismiss civil war out of hand. Surely we can't end up in a civil war. Civil unrest, maybe. Brexit headbangers are openly ringing up radio stations such as LBC and talking up civil unrest if Brexit doesn't happen in the particular way they want it to happen; On the Today Programme on yesterday, Nigel Farage used the word 'fight' with regard to defending Brexit when being interviewed by Mishal Husain; and countless MPs are being called traitor by Brexit headbangers outside the Houses of Parliament. Are these the the early signs of something more frightening. I keep hearing the army are on standby. I was talking to an Egyptian friend of mine, he made the observation that civil unrest starts when a rally or march gets attacked by the opposite side. Could this happen today?? Interestingly, a Professor of Political Economy has noted similarities between the Brexit divide and the English Civil War. They are mainly geographical, but the semblance is apparent in other elements. The above is all hypothetical, but sometimes I wonder how is this going to end? Media just as much to blame for the Brexshit we're in. Brexiters who are in the media or national politics are either stupid or pandering to their audience. So say I! Those who are radio presenters are essentially audio journalists, much like a reporter for the Daily Express. The readership of the Daily Express expects an anti-immigration slant OR pro-Brexit twist so the reporter writes a story to fit. The same HAS to apply for radio presenters. They are in the numbers business. A commercial radio station is almost entirely interested in listening figures. No listeners = no advertising revenue. 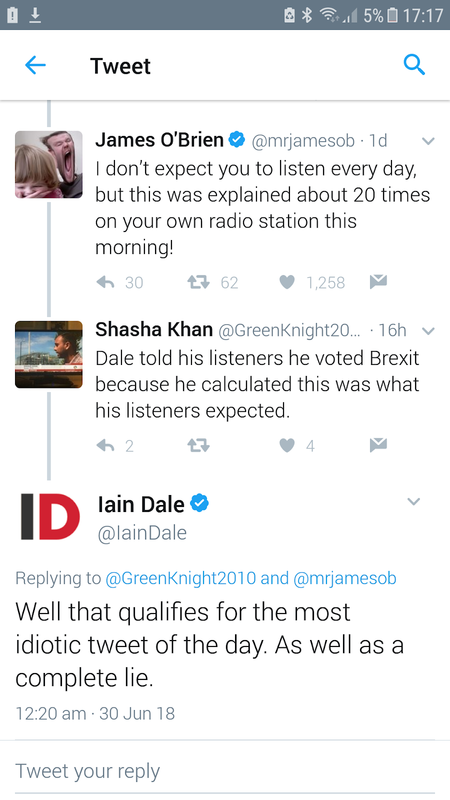 I remember Iain Dale back in June 2016 maintaining a position of 'undecided' on the IN/OUT question. He finally backed Leave - at least publicly. At the time I thought this wasn't an action based on sound logic, unless one has calculated that for commercial reasons it would be better not to lose your audience. So, when Danny Dyer famously blasted David Cameron I scanned the debate with interest, especially when Iain Dale tried to make capital out of it. I might be wrong about Dale in my assertion but I doubt it. In he full exchange he tries add weight to 'idiotic tweet' jibe at me. 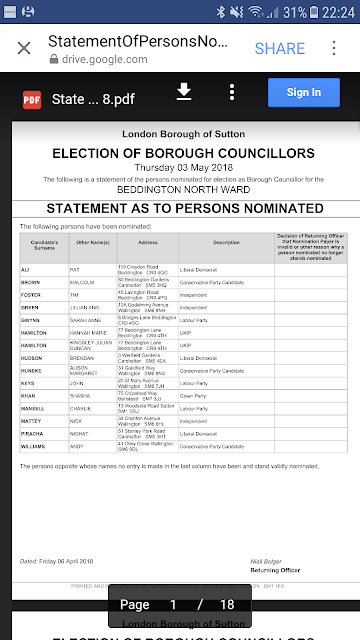 The result in Beddington North was quite a surprise to many observers. 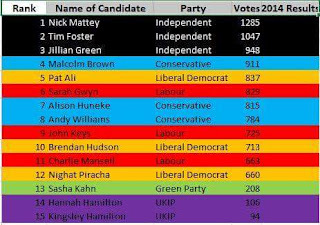 Councillor Nick Mattey, formerly a Liberal Democrat, latterly a Green managed to get re-elected as an Independent with two other councillors. This news also managed to get into Private Eye magazine (above). I chatted to Nick Mattey (his graphic above - poor spelling of my name) throughout the campaign. 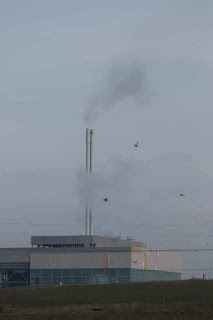 Our involvement in the Stop The Incinerator campaign has resulted in a friendship. 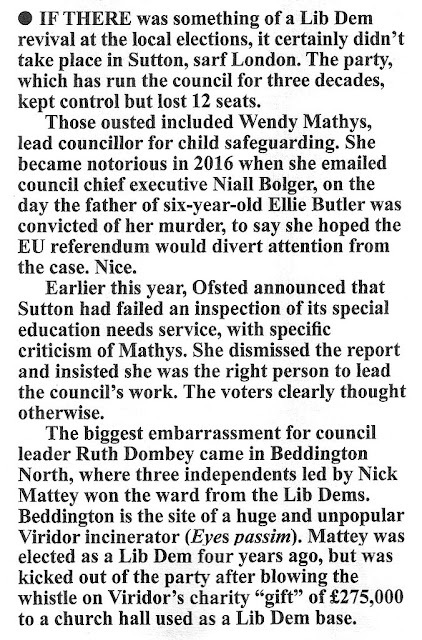 1) Nick Mattey has been an active councillor in Beddington North. People know him. He has fully canvassed the households in the ward. If he wasn't a sitting councillor it would have been almost impossible to achieve success. 2) The Lib Dems in Sutton are serial leafleters around election time. 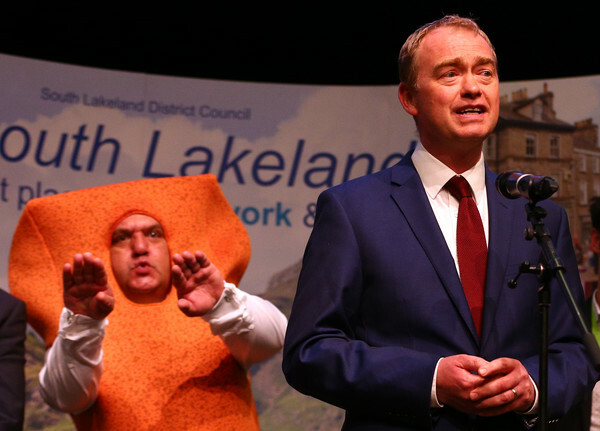 Nick managed to orchastrate a campaign which exceeded the Lib Dems in terms of sheer volume and cost. I know he spoke to the Electoral Commission to work out how he could spend his way to success. 3) Voters are cynical about politicians more than ever before. Voters are learning that voting for a political party doesn't mean 'X'. It could mean 'Y'. For example, if you are a BREXIT voter, which political party represents your voice? 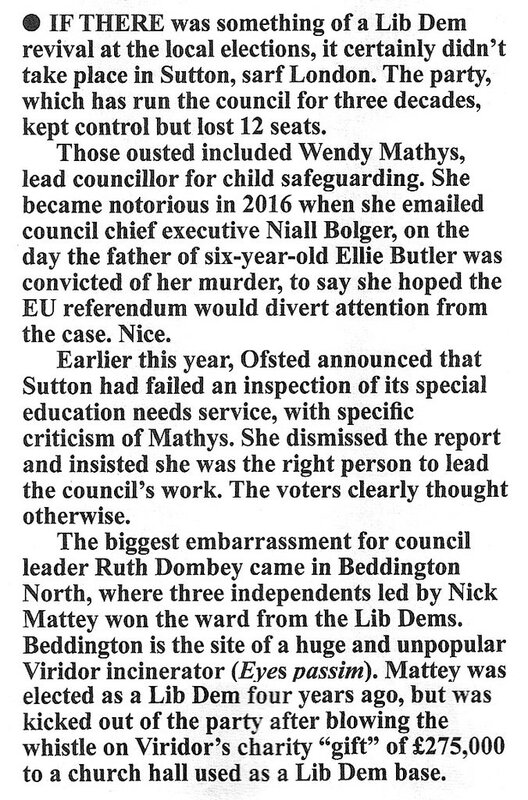 The people of Beddington North have experienced deceit on an unprecedented scale. It was logical to turn to three residents who, total combined, have lived in the ward for many decades. The 1.96 per cent votes I polled was to be expected given Green votes were probably going to the three Independents. This coupled with the fact that I don't actually live in the borough and both Labour and the Conservatives threw everything at the ward to win these three vulnerable Lib Dem seats suggests the result was fair. 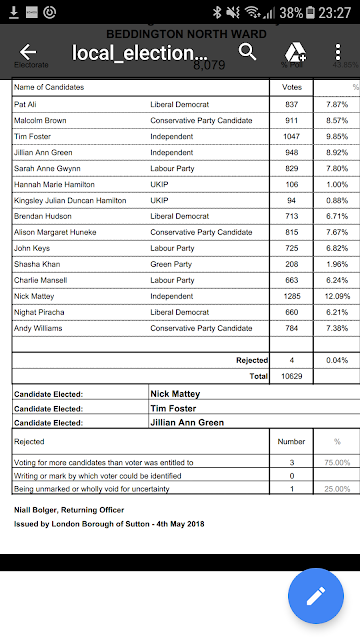 On average Green candidates polled between 2 and 3 per cent in Sutton. I took the above picture at the Count. Nick Mattey is in the foreground. You can see the other tables have finished counting but because of the Independents - bundled in with the split votes - the counting continued long after other wards had declared. The result in Chipstead, Hooley and Woodmansterne was completely expected. The Tory won by landslide. Interestingly less than 100 votes separated the other candidates. Scoring a similar margin of victory to the Conservative was the irrepressible Jonathan Essex in Redhill East ward. He is one of the legends in the UK Green party. More good news was the election of Hal Brown in Earlswood and Whitebushes. Full details here. I've been leafleting with colleagues in Beddington North ward in London borough of Sutton. As usual the Lib Dems are manically leafleting the ward to hold onto their three councillors. The result this time is uncertain. 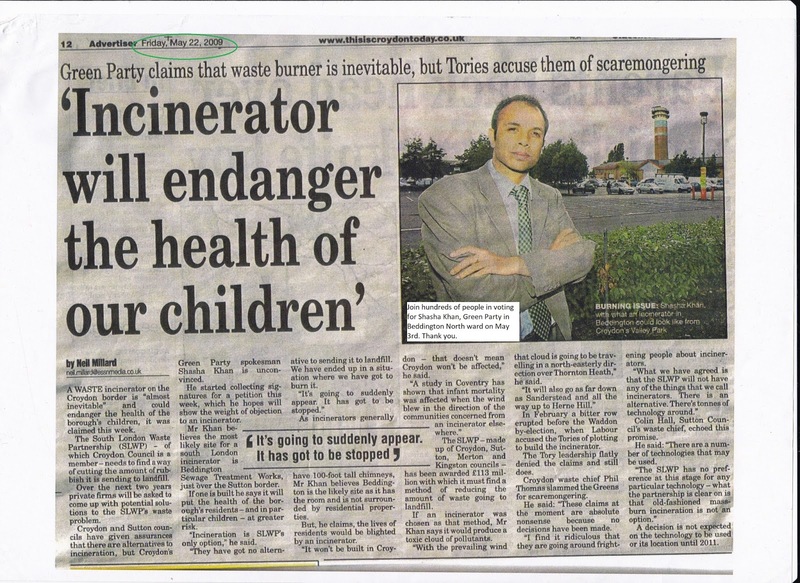 My logic is that if people are concerned with the incinerator, which is located in the ward, they shouldn't look further than someone who has fought 10 years to to stop it. The above newspaper article is from 2009 and I am using it at a basis for the final leaflet. Labour and the Tories also think they will win this ward. Basically, everyone standing genuinely thinks they can win and this will lower the threshold to finish in the top three. 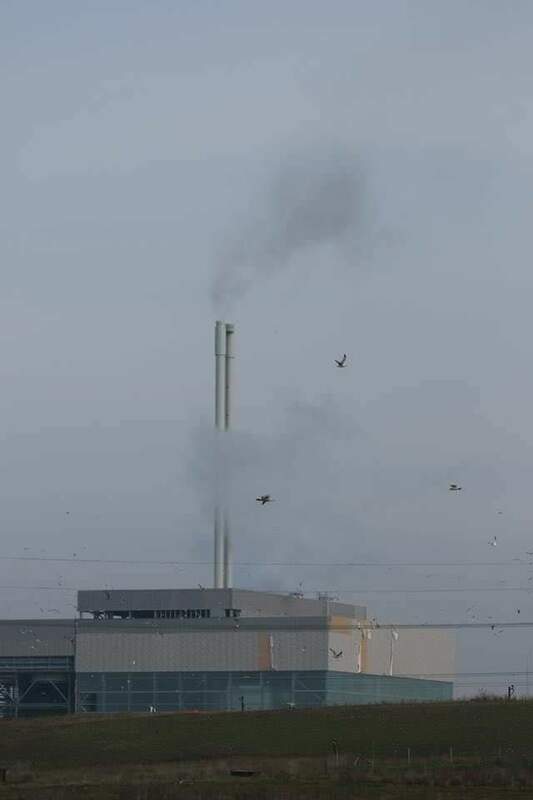 Anti-incinerator campaigner Nick Mattey is standing as an independent with two others and he is throwing everything into the campaign. Nick is bit like Marmite, not everyone's favourite yeast base spread. I bumped into him when leafleting and it was good that we still have good respect for each other even though we in a battle to win the seat. 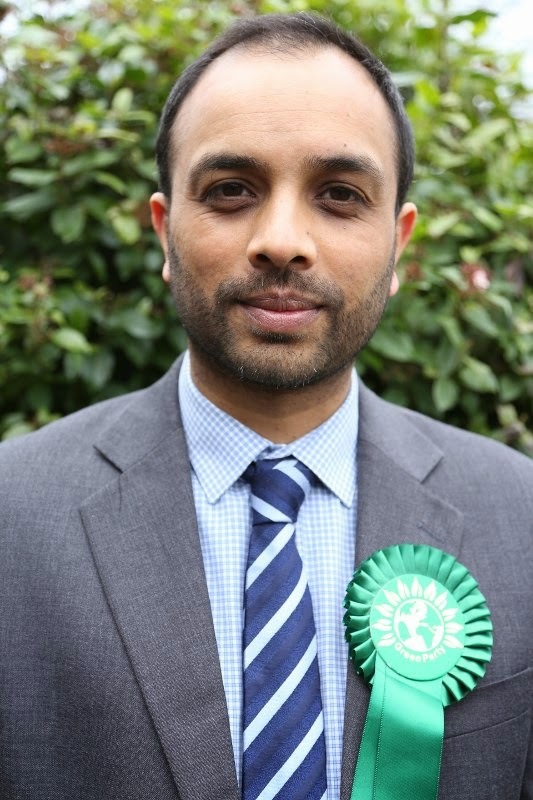 I am also standing in Reigate and Banstead council elections in my home ward. I can't begin to explain how sad this image makes me feel. Last Thursday I went along to City Hall to hear Shlomo Dowen of UKWIN (United Kingdon Without Incineration Network). I didn't enjoy the experience. Shlomo was brilliant but he was only one voice among six. Julian Walker and Dan Cooke - our paths have crossed a couple of times already - spoke with great authority. That is their skill. 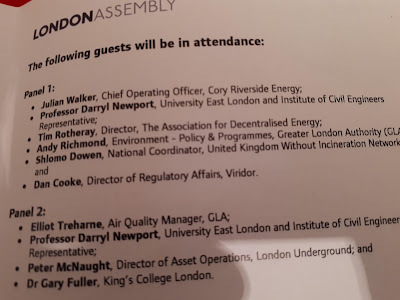 Professor Daryl Newport was the only partial ally Shlomo had.. 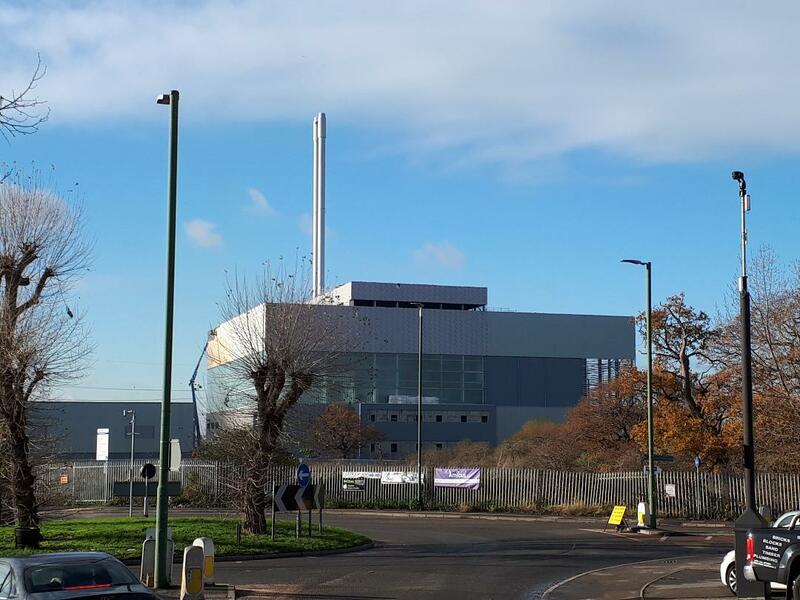 It was mentioned the Beddington incinerator and a revamped Edmonton incinerator are the residual waste solutions for London for the next 25 years. Those on the committee, asked questions and listened to responses. Caroline Russell of the Greens and Nicky Gavron (Labour) queried the logic that ruled the room but to what end? Nothing is going to change at GLA level. AT THE END OF THE DAY IT COMES DOWN TO THIS: WHO DO YOU CHOOSE TO BELIEVE? Picture of me at the meeting below. Today, President of Zimbabwe Robert Mugabe resigned. Here is his letter of resignation. In early 2003, I arranged to see my then MP, the late Malcolm Wicks - MP for Croydon North. At the time I was stunned to see the UK join the US in invading Iraq. Sitting on a huge majority and as minister, Wicks did what was expected of him and supported the war in Iraq. It incensed me enough to focus my #GE2005 campaign on his unequivocal support of the invasion. In our meeting in his Friday surgery back in 2003, Malcolm Wicks assured me that we would find WMD. He pointed out Saddam Hussain was a tyrant and a dictator and that he had to be removed. I said if that was the UK's policy then why didn't we get rid of all the despots in the world, e.g. Robert Mugabe. Mr Wicks replied, "Things are changing in Zimbabwe, he'll be gone by the end of the year." As it turned out, just like his WMD prediction, Wicks was way off the mark - nearly 15 years off the mark. 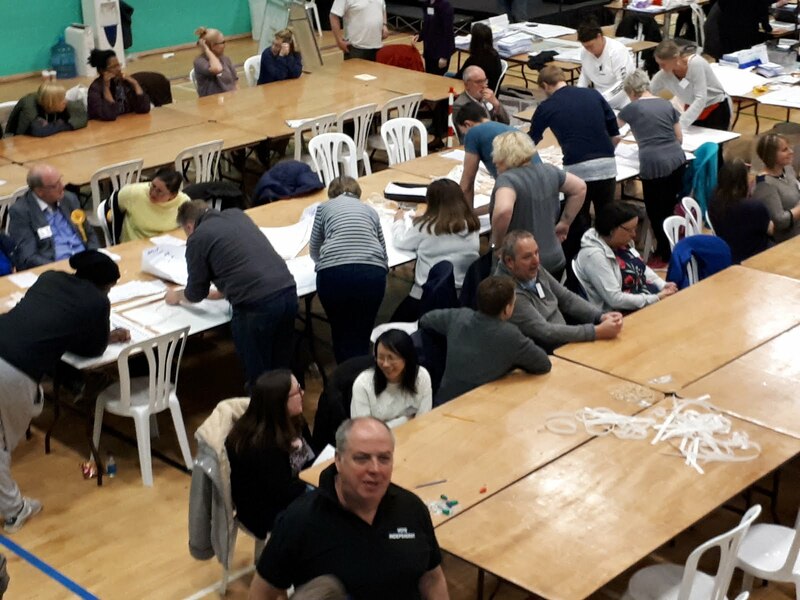 After speaking to the Electoral Commission, I can confirm they have advised me that there is no course of action I can take BUT they have made a note of what happened in Sutton on the night of the count. London Borough of Sutton Council, CEO, Niall Bolger protected Lib Dem Tom Brake from embarrassment at the General Election Count in 2017. He did this by choosing not to allow candidates on stage for the declaration. There is a democratic tradition to allow Mr Fishfinger or Lord Buckethead to heap ridicule on any politician. However, Niall Bolger, Sutton CEO, and thus the Returning Officer for the election, is allowed to run the Declaration as he pleases. 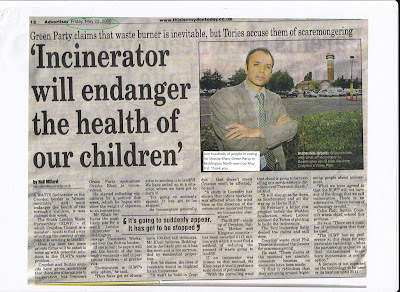 Knowing he is knee deep in involvement with the incinerator, along with Tom Brake and Cllr Ruth Dombey, he chose not uphold the democratic tradition of this country, and to avoid any embarrassment on national TV. Furthermore, however outrageous a notion, is it possible that Niall Bolger would magically make some opposition ballot papers disappear to ensure victory for his Lib Dem allies? One very senior candidate complained that Tom Brake knew the result of this marginal seat (Carshalton and Wallington) before any other candidates. I spoke to the Electoral Commission after receiving a reply from Local Government Ombudsman. The Electoral Commission advised me that there are a number of powers which are handed to the Returning Officer, including the Declaration, when organising elections. For example, if he wanted to introduce the winner on stage with a drum roll and indoor fireworks he is entitled to do so. Presumably, he can let a favoured candidate know the result before others. I have considered what Mr Y said in his complaint. What I found Mr Y was a candidate in the last general election and complains the Council decided not to allow candidates on stage when the declaration of the result was announced. Mr Y feels he should have been allowed to stand on stage and feels he was denied this right. The Returning Officer is responsible for organising elections. In this role, the Returning Officer works independently and not on behalf of the Council. The Ombudsman has no legal jurisdiction therefore to investigate complaints about the organisation of elections. This includes how the result was announced. Final decision: We have no legal remit to investigate the organisation of elections and so cannot investigate Mr Y’s complaint. "In recent times, candidates have not stood on the stage at Sutton when the counts have been announced". WRONG!!! At the previous General Election, candidates were allowed, and he allowed it. 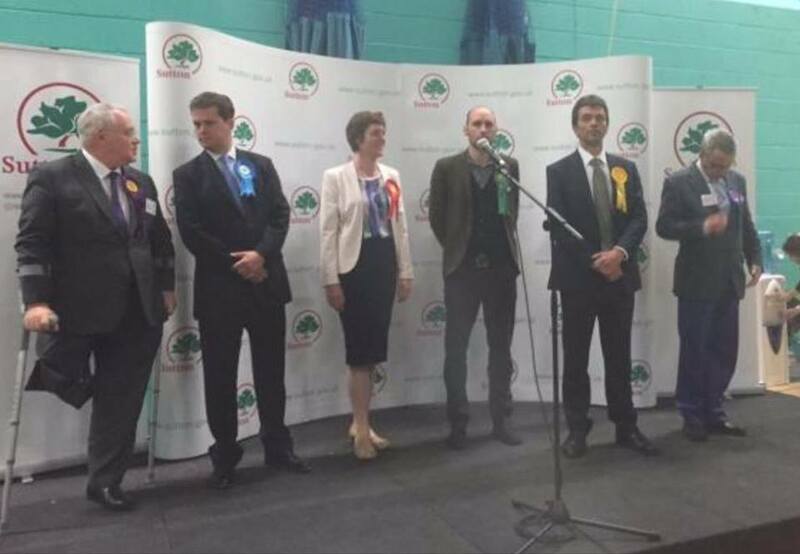 Sutton were not alone in not asking candidates to stand on the stage - Merton and Croydon did the same. House keeping that seems relevant - I am not sure whether you attended the 2015 count in Sutton, you would have noted that we managed to add two extra teams meaning that the stage was smaller - the main reason for this is that we ran the count as mini counts in wards and we have 18 wards - this meant that we finished almost 2 hours earlier this year. With this in mind I for future need to re-arrange my count floor so the stage remains a decent size and there is room to move at the front of the hall - you will have noted how cramped it was which is why we removed tables at the end. The decision taken not to invite candidates was not political or for the reasons the article and tweets implied. "NO! I have made my decision," and then walked off.